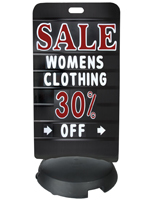 These letter boards with fillable base are made of strong plastic with a white and black finish. The displays come with a set of (314) characters for creating changeable messages on the sign's (7) lines. 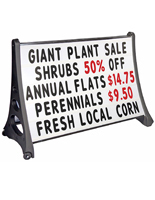 The sidewalk letter boards are made for both indoor and outdoor placement and can easily be transported with their built-in wheels. 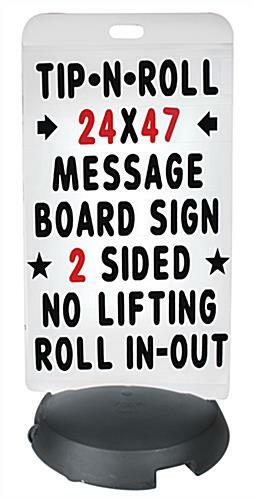 The signs are great for advertising to passersby in alleys, hallways and on sidewalks with their double sided design. 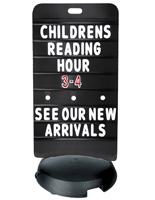 The changeable message boards have a 24" stand that makes them slim enough to fit through doorways. 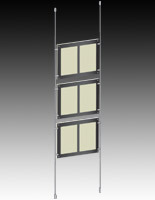 The plastic displays are also available with a white backing surface and include black lettering.